Very nice. Don't know if it's true that they never go flat, but great so far. This two-pillow package comes with three firmness choices: medium, firm and extra firm. The pillows are purely synthetic while the fabric all cotton. Standard/queen dimensions are 20 inches wide and 28 inches long while the king covers' dimensions are 20 inches wide and 36 inches long. The machine washable features enables you to clean the pillows whenever you deem fit. For the past six months I have been searching for a good set of pillows, but to no avail. After having purchased a set of pillows for $89.00, a piece I was very disappointed. I decided to give up on that quest. That is until I saw these pillows 2, for less than the price that I had paid for one. I purchased two sets and I must say that was one of the best decisions I made in quite a while. I am so pleased and completely satisfied with these pillows they are truly comfortably. Since having purchased these I've slept like a baby. I highly recommended these pillows, believe me you won't be disappointed. So far after 4 weeks of use the pillows have held up very well. I got the king firm with a 2 inch gusset. Really a true king size for the pillow slips as they fit really tight. Holds up well. Will be returning these for "medium" as the "firm" is unsuitable for any side sleepers. Your neck will definitely be at an angle. Wish the cotton cover offered more thread count/softer, but overall I enjoyed the grommet and construction. Note: cotton cover has no zipper/is not removable. I adore this pillow! I shopped at many stores feeling a pillow had to be felt to be sure it was the right density, firmness and overall quality. I could not find what I really needed and wanted. I decided to give my old favorite site a chance (I have been with OStock since thy first went online! - I am a long time client.) So - I saw these pillows - read the reviews and felt - a hunch - that they would be right - perfectly right - in the firm density. I am so glad I went ahead and got them! They are terrific! They are not foamy or bouncy pillows - but show and contour your head or side and yet in the morning, they bounceback to their original fullness. My bed looks weird now - these pillows take up space - I keep six on my king size bed - will probably remove two - they are nno longer necessary with this fabulous pillow - I got the set of two and I am a very happy dreamer. They are remarkable - also, haven't had a night sweat since I got them - excellent - excellent - excellent - for me - for I am allergic to down feather pillows - and eiderdown is ridiculously expensive. The price, the quality - the comfort are all here. WOW - what a pillow! Just got two sets of these pillows and they are just as described. They are dense but, not too much. A very wide gusset makes them look great on the bed, not a flat pillow. Very good pillows. It's true, they don't go flat, Yet very comfortable, especially for side sleepers. Love these pillows. Hotel Madison 300 thread count pillows are great I bought two sets one set for my daughter and son in law. The pillows are soft fluffy and firm I get a very good night sleep, would recommend to all. I really like the Hotel Madison 300 Thread Count Pillows! The are very good quality and they stay very full just as stated. They do have a little less fullness if you sleep in the same position for a very long time, but easily fluff back up. I purchased the extra firm and it is very comfortable. No neck problems from sleeping on this pillow. I highly recommend these pillows. The pillows are excellent and are just as advertised....however not for me! I won't send them back because it's not the fault of the company....just not my favorite. Excellent customer service and fast shipping. And if you like full pillows and are a side sleeper these might just be for you. These pillows are great for sitting up reading in bed, for those who need to lie flat with legs up on pillows and for stuffing pillow shams. they are very firm and thick. I doubt they will ever go flat! I opted for the Firm Pillows and boy do I love these pillows! I am a side sleeper and I beat up my last pair of pillows trying to find that perfect firm yet plush pillow feel I like to sleep on. The first night with these pillows was heavenly! I almost got the extra firm because I wasn't sure how firm these pillows were but the normal firm will be all I need and more! I am extremely happy with my purchase! I had high hopes for these pillows. When I first began using it, it was nice and big. Within a month, these pillows became very flat. These pillows will not stay the same size you see when you first receive it. I got these hoping to replace tired down on my couch. They didn't quite work for that, but are so soft and comfy that I am keeping two of them for my bed. Though they look full and keep their shape, they mash down with the weight of my head and are as satisfactory as down. They did not fit the slipcovers I made for them because they are not the right shape for a box cover. Definitely a learning experience for me. They are a tight fit in some of my pillow cases but worth the effort to stuff them in. Probably the best pillows I've ever purchased and I was a little hesitant because I like to be able to feel the pillow before I purchase. But definitely didn't go wrong with these. So far they seem like great quality. I purchased firm and it holds true. At long last I have found the perfect pillow. This pillow has not gone flat which all other pillows I have purchased in the past have. I have bought so many looking for this exact one. You will not be sorry for this purchase. LOVE IT! Great pillows! Slightly firm but not too firm! Definitely not for you if you like soft pillows though. We have 6 of them on our king size bed and it’s a bit overkill as they’re really big! I am constantly in search of comfortable pillows that maintain their shape and support my tendency to sleep on my side. So far these have worked out very well! Firm and supportive but not too hard. Nice, fluffy pillows that won't go flat (at least not so far, after a few months). Excellent density, but certainly not hard. The packaging was a little underwhelming as both pillows were simply in a giant plastic bag. I would have preferred something a bit more contained. "The specifications indicate that you can specify 2" 1.5" or 1" gussets. But I found nowhere to indicate that. What do I do?" I ordered queen size and medium firmness. The gussets are 2 inches, and I didn't find anywhere to choose gusset size either. "Can these be shipped to India?" Probably. You'd have to ask Overstock. "I WANT TO CANCEL THIS ORDER BEFORE IT SHIPS.HOW?" "ordered extra king firm. received ones that tags say king firm. shipped wrong size, but still these were so huge and overfilled, king wouldn't fit in a king pillow cover. so hard and tall and overfilled, no way could you sleep on them without hurting your neck. there is no give to these and I believe defectively overfilled and oversized, at least on the ones that came. wonder if anyone got the medium density king and if those are built the same oversized way or if they do fit in a king cover and you can actually sleep on them? I'm asking for a return of the ones they sent me that there's no way anyone could use, but thinking of replacing them with the medium king and hopefully those would be the correct size to fit in an actual king cover and that you could sleep on them without breaking your neck?" 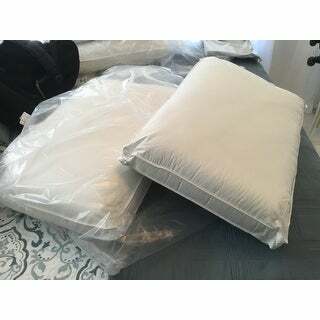 I ordered the medium king and they are so hard I finally ending using them in decorative pillow shams. No way could I sleep on them. I ordered the same and have had the same result. Too firm. Good for sitting up against or putting under your feet to elevate them. i have two of these pillows, they are very firm, but i also find them a little too hard to be comfortable. They have very little "Give", so your head is always bent upwards. If i could i would buy a less firm pillow. "I would not use them as sofa pillows. These are bed pillows. " These pillows are okay, but not great. They do flatten or should I say concave while sleeping on them. So there is the issue of proper support. Although they do come back to shape and have a good quality fabric, Not completely disillusioned, but I don't believe I would purchase them again due to the support issue as that was my incentive for purchasing them. 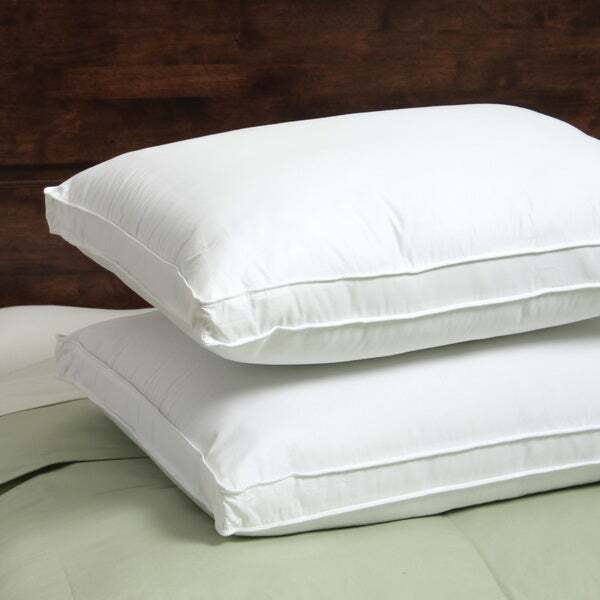 "I see these come in a set of 2 pillows...but what if each spouse likes a different firmness? Example: I like extra firm, but my husband likes just firm, and wouldn't want the extra firm." Does Overstock carry these pillows where you can buy just ONE pillow?? I like extra firm, and my husband likes firm, so I need to buy them singly! Thanks. "How long and wide (measurement in inches) are the KING size pillows?"